Need help cleaning garments? Whether it’s your mom’s wedding dress you want to restore or a new pair of jeans, ASAP Cleaners are experts in Garment Care! 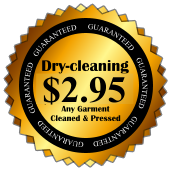 Ask for a quote or schedule your dry cleaning pick-up. ASAP Cleaners can be reached through these numbers.